Thiru Chirupuliyur is one of the 108 Divya Desams of Lord Vishnu located in Tiruvarur, Tamil Nadu. Thiruchirupuliyur also has known Thiru Sirupuliyur/Chalasayanam/Bala Vyagrapuram. This is one of the oldest Divya Desams of Lord Vishnu with two Praharams and 75ft height Rajagopuram. Renovation is under way at the Sirupuliyur Kripasamudra Perumal temple, a divya desam, whose legend dates back to Garuda Puranam, where one finds reference to the battle of words between Adisesha and Garuda, the Lord's vehicle, as to who played a more important role in their service to Lord Vishnu. Two old rishis, Yagapalar and Kanvar, prayed to Lord Shiva at Chidambaram asking for Moksham. Shiva directed them to go westwards to Srirangam, stating Vishnu was the one equipped with the powers to grant Moksham. Because of their poor eye sight, the Rishis instead went southward, lost their way and reached KripaSamudiram. 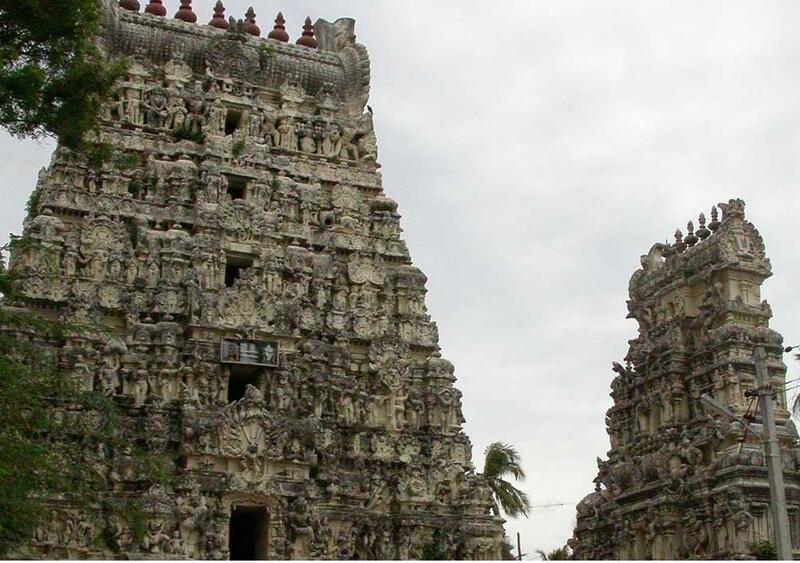 Here, they prayed to Lord Vishnu saying that they were to come to Srirangam to invoke his blessings but have now lost their way and that he grant them Moksham. It is believed that that the Lord originally gave darshan to the Rishis as Lord Ranganatha (like in Srirangam) in his full form. Because of their old age, the rishis could not see, clearly, the big image of the Lord and hence the Lord gave darshan in a smaller form known as ‘Bala Sayanam’. The Lord KripaSamudran can be seen as a small kid in sleeping posture. Being the Lord in small form, this place is called Siru(small) Puliyur. A special feature of this temple is that this is one of the only two Divya Desams where the Lord in sayana kolam (sleeping posture) is facing the Southern direction, the other being Lord Ranganatha of Srirangam. Once Garuda (the Vaahanam of the Lord) and Adiseshan (on whom rests the Lord) got into an argument as to who was more powerful and devoted to the Lord. Seeing Garuda a little arrogant, Lord Vishnu went in favour of the Serpant God. Worried that Garuda might be angered at this, Adiseshan seeks Lord’s protection, upon which Lord asks him to roll himself and lie under him. It is said that as a result of this anger, Garuda never flies over this place. Another story goes that the aged Rishi Vyaakrapadha undertook penance at Chidambaram invoking the blessings of Lord Nataraja for attaining moksham. The rishi was directed to go westwards to Srirangam as Lord Ranganatha was the one equipped with the power to grant Moksham. Owing to his poor eye sight, the rishi lost his way, went southward and reached Kripa Samudiram. Unable to walk any further, he sat in penance at Sirupuliyur. The Lord appeared in his full sayana posture like the one in Srirangam. Since the sage was not able to take in the big form with his feeble eye sight, He appeared in the form of a child - Baala Sayana. As this was the place where Kripasamudra Perumal accorded a special status to Adisesha by placing him above Garuda, this temple is of special significance for relief from Naaga Dosha and Kaala Sarpa Dosha. This is the only divya desam where there is a separate temple for Adisesha. Unmarried people and childless couple can also visit this temple for solution. 07:00AM – 12:00 Noon and 05:00PM - 08:00PM.